Open, open, open! That was me about a month ago, my nose pressed against the glass door of Shin-Sen-Gumi 2 Go like that crazy lady from the Target commercials. I don’t think I was the only one like that. As the workers rushed to put the finishing touches on Shin-Sen-Gumi’s new casual food restaurant on Western Avenue in Torrance, they started a countdown in big sumi-e brush numbers posted on the window: 17 days, 16 day, 15 days … until eventually one day to go. Shin-Sen-Gumi chief boss Mituyasu Shigeta fashioned his new format after the demae food-delivery services that are very popular in Japan. At the cafeteria-style buffet line there are an array of yakitori skewers and also pre-packed bento and onigiri. From the kitchen you can order hot dishes like Hakata-style ramen, udon, curry rice and donburi. I ordered a yakitori bento and was pleased to also try the combination soft drink and Satsuma (sweet potato) fries, which were served hot and crispy. 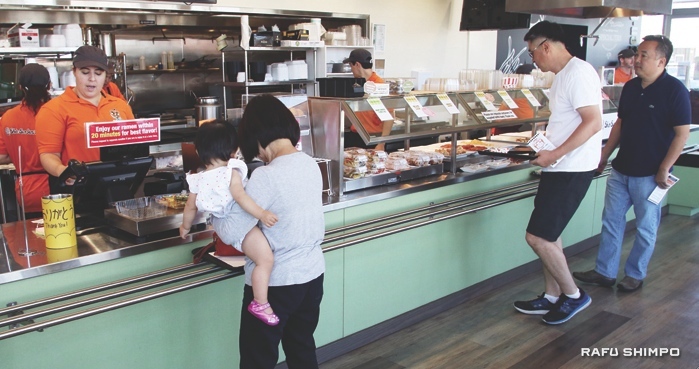 In many ways it is a modernized and updated version of the small cluster of to-go stands that Shin-Sen-Gumi operated in Tokyo Central Market in Gardena’s Pacific Square. Shin-Sen-Gumi kyokucho (chief boss) Mitsuyasu Shigeta said he based his newest restaurant on the concept of demae the food-delivery services that are prevalent in Japan. For busy office workers, the demae will deliver hot ramen or other dishes on their motorbikes. 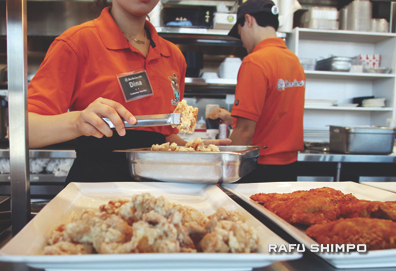 Shin-Sen-Gumi 2 Go is located at Western Avenue and 182nd Street in Gardena. “The time if very important, we have to move quickly, maintain the quality and of course the quantity too. Everything combined so the balance is very important,” Shigeta said. 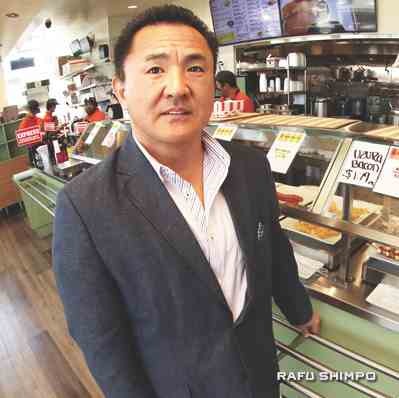 Shigeta, 51, has the build and demeanor of a man who earned his black belt in karate while studying at the Ashihara Dojo in Los Angeles and workers often sound like martial arts students, yelling out boisterous kiai to greet customers. The first Shin-Sen-Gumi, a yakitori restaurant, opened in Gardena in September 1992. This year they will celebrate their 25th anniversary with a festival. Proceeds from past festivals have gone to charitable causes such as relief for victims of the 2011 earthquake and tsunami in the Tohoku region. Shigeta says he feels responsibility as an ambassador of culinary culture for Japan. The cafeteria-style buffet line offers several choices, including an array of yakitori skewers. Now that the restaurant is open, one more sumi-e sign has been posted promising a drive-through window. It will be interesting to see how ramen can be translated into L.A.’s drive-through food culture. But if anyone can do it, it will be Shin-Sen-Gumi. 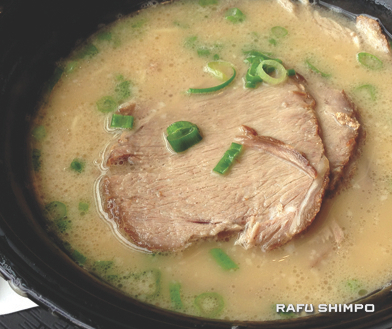 Shin-Sen-Gumi 2Go is located at 18203 S. Western Ave., Gardena, #104. Hours are Tuesday through Saturday 6:30 a.m. to 9:30 p.m.; Sundays 6:30 a.m. to 8 p.m. More information is available at www.shinsengumigroup.com. 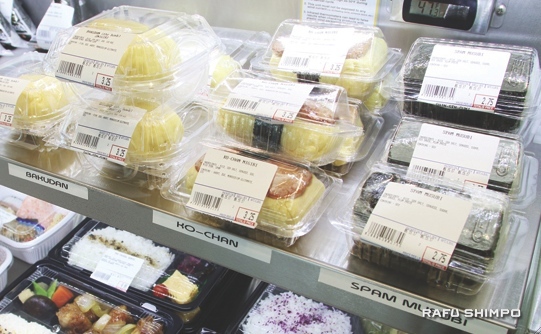 In addition to its legendary ramen, Shin-Sen-Gumi 2 Go offers pre-packed bento and onigiri for those wanting tasty eats on a tight schedule. Customers line up at the newly opened restaurant.